If a contributor doesn't need access to your site or if they leave your business, you might want to remove them. This blocks them from logging in and making any changes. If the contributor created content on your site, you'll be prompted to transfer ownership of their content to a different contributor. Tip: To remove yourself as a contributor, visit Removing yourself as a contributor. Only site Owners and Administrators can remove other contributors. If you're a Site Owner, transfer ownership to another contributor before you can remove yourself. Removing a contributor can't be undone, but you can invite the same email address to contribute to your site again. 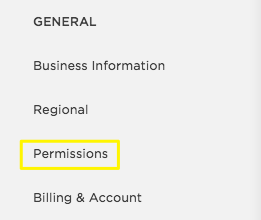 Scroll down and click Remove Access to remove all of their permissions. The contributor moves to the Contributors Without Permissions section. If they may need access later, you can leave them in this section and stop here. To remove them completely, continue to the next step. In the Contributors Without Permissions section, click the contributor's name. In the drop-down menu in the window that appears, select a replacement contributor. This ensures that all content they contributed, such as blog posts, has a new author listed in their place. Tip: To add a new name to this menu, click Cancel, add a new contributor or basic author, and then restart this process.